I often still awake after midnight. Last night, I laid on my bed and looked at the ceiling, I was not thinking of anything but just could not sleep. Few minutes after 12, I suddenly found that some kinds of light went through the window and lighten up my bedroom. 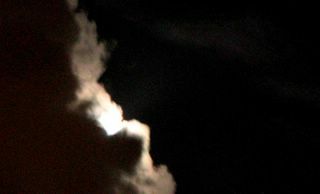 When I turned my head looking through the window, I found a shiny moon and a large dark cloud was just around it. I brought out my Canon v3 and take these shots. Though the pics were not good, I still loved them much - it lightened up almost half of my little bedroom. We should not sleep so early that miss the wonderful moonlight. 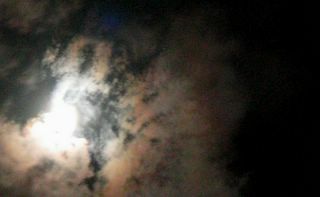 I immediately downloaded the pics to my PC and send to my friend - she might enjoy the same moonlight as me in Fukuoka. After sending the pics, heavy rain came.